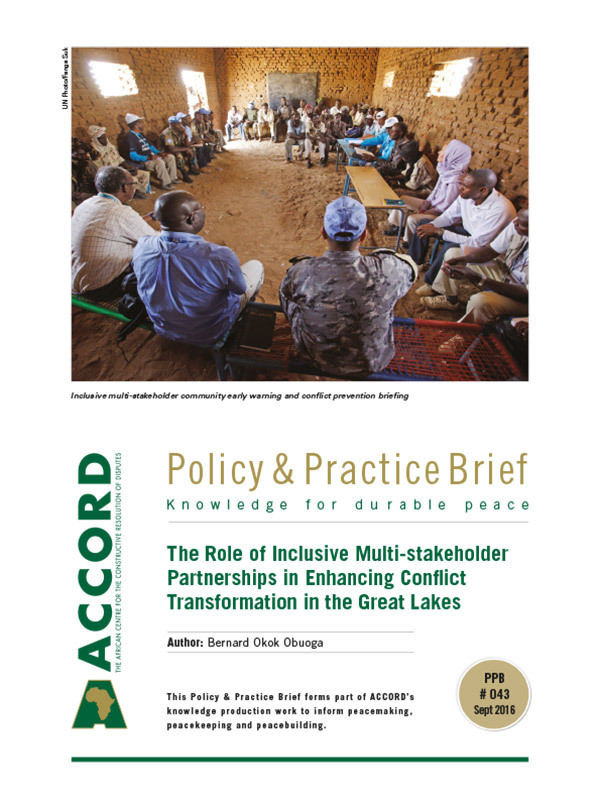 Cyclical conflicts which continue to plague the Great Lakes region of Africa necessitate a reflection on the effectiveness of peacebuilding interventions. While many reasons account for this, without knowledge of triggers of relapse into conflict, and without enhancing grassroots-based approaches to managing the causes of conflict, peace will remain elusive under existing intervention frameworks. The Great Lakes Project (GLP), a collaborative initiative by the African Centre for the Constructive Resolution of Disputes (ACCORD), the Global Partnership for the Prevention of Armed Conflict (GPPAC), and the Nairobi Peace Initiative – Africa (NPI-Africa) – developed a three-year project in 2012, titled “Consolidating Peacebuilding in the Great Lakes of Africa”. The overall purpose of the project was to ensure that local communities were mobilised to engage with, and address, conflict factors through grassroots civil society organisations (CSOs). The project also sought to identify and address the capacity gaps of local CSOs working towards peace and ensure that systems were established to continuously address conflicts in the region. 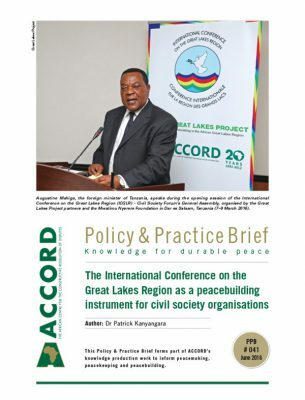 The International Conference on the Great Lakes Region (ICGLR) was identified as a critical partner in building peace in the region, considering its extensive network and access to state and non-state actors. This engagement therefore facilitated partnerships between existing CSO-platforms; strengthened their early warning systems and strengthened their conflict management capabilities towards building resilient infrastructures for sustainable peace. While undertaking its mandate, the GLP identified various challenges and policy gaps, which included the lack of strategic approaches to prevent conflict relapse. This paper illustrates and interrogates the dynamics of these shortcomings, and defines the role of inclusive, multi-stakeholder partnerships to address these. In contemporary terms, the Great Lakes region can be viewed as an environment saturated by conflict interventions and actors. These interventions have, however, achieved very little in the way of positive results. A key factor contributing to the lacklustre results of interventions is that issues in the region are analysed in a myriad different ways, by different actors, resulting in incoherent and uncoordinated approaches. There is, therefore, an urgent demand for actions towards a sustainable and community-owned peace and security agenda that is geared for inclusivity and long-term development. The main questions that need to be addressed are around why conflicts in the region are so violent, mostly intractable and usually highly cyclical. 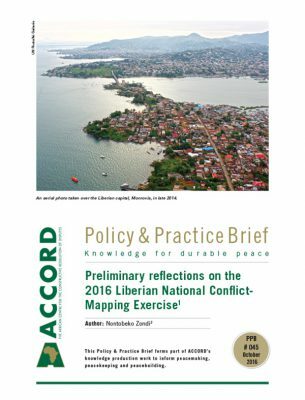 This policy paper seeks to analyse the conflict dynamics of the Great Lakes region, based on the above theories, and proffers insights on GLP interventions, approaches and empirical outcomes. It also seeks to outline present GLP interventions, whilst putting forward a number of strategic recommendations. Further, poorly managed or unresolved problems around, and the movements of refugees across borders can also be used to explain certain trajectories of violent conflicts in the region. Two levels of historical understanding emerge, especially with regard to the Rwandan genocide: first, its genesis and direct link to regional violence, and second, its role in other peripheral conflicts. The genesis and direct link of regional conflict with regard to Rwanda can be understood when one looks at the political dynamics in Uganda in the 1980s. The 1994 Rwandan genocide can be partly traced back and linked to the initial movement of Rwandan refugees into Uganda “between 1952 and 1959 when the Belgium political reforms threatened the intermediary position of the Tutsi oligarchy in the colonial state and provided some limited autonomous political space to the Hutus, which challenged the privileged position of the Tutsis”.5 The refugees’ movement into – and subsequent acceptance by – Ugandan communities in the west of the country could be attributed to the “close cultural and kinship ties between the Mpororo kingdom in Uganda with the ruling houses of Ankole (Hima) and Rwanda (Tutsi)”.6 Given that this situation did not have an adequate solution in either country, the consequent environment spurred the creation of an agenda towards their “enemies” – the Hutus. In addition, the ascent to political power in Uganda by the National Resistance Movement (NRM) in 1986, which brought a semblance of peace to the country, provided Rwandan refugees with a conducive environment within which to consolidate their base and strategic agenda. Hence, in “1989, an abortive armed invasion of Rwanda by the Rwanda Patriotic Army (RPA)”7 followed. The RPA were also militarily “prepared” by the National Resistance Army (NRA) when they participated in the Acholi, Teso, Kasese and West Nile counterinsurgencies.8 This generated negative sentiments towards the RPA from the Ugandans, and demands for them to leave the country increased. The second level refers to the role and impact of the Rwandan genocide vis-í -vis the Democratic Republic of Congo (DRC) and its respective conflicts. From this observation, it is clear that intrastate socio-economic and political dynamics, if not internally and peacefully resolved, are capable of plunging an entire region deeply into turmoil. 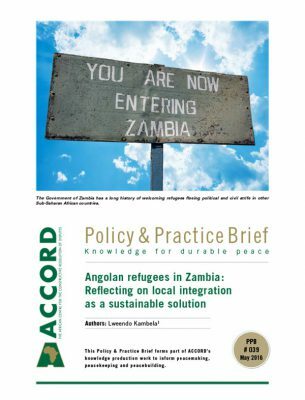 The violent conflicts emerging from such intrastate dynamics and the subsequent flow of refugees into neighbouring countries can adversely affect peace in the region and the way in which states manage their internal political affairs. It can, therefore, be noted that the inadequately managed periodic violent conflicts in Rwanda and the related regional movements of refugees sparked a wide range of violent dynamics across the entire region. Further, what is emerging in most of the region’s countries are cases where citizens are rising to demand inclusive political and economic policies and the equitable distribution of resources. If adopted, these can lead to participatory constitutional changes and, ultimately, peaceful transformation. Cases in point include the political situation in the DRC and the just-concluded electoral process in Uganda, where the question of electoral management processes and institutions are at the centre of the current and potential disputes. However, scenarios have already demonstrated that the tightening of political spaces and development of dictatorial policies and laws that hinder political freedoms have become the order of the day. There is a clear need to define, develop and promote the implementation of new policy orientations in conflict prevention. The GLP underscored the central importance of this, as well as the consolidation of local efforts towards attaining sustainable peace and stability, and effective conflict transformation efforts. In the region, the development of strategic interventions and approaches to conflicts – whether violent or not – need to take into account the past and existing dynamics. The key features of the regional post-war political (and socio-economic) landscape include an enduring centralised government, a fractured opposition and shifting regional alliances.11 Arising from this have been many cases of turbulent electoral processes and cycles in which the key theories behind conflicts, detailed above, come into force. In respective countries in the region, there are those who, while in power, would wish to retain and use it to control the economics of the country, on the one hand. On the other hand, there are also those out of political power, struggling – sometimes violently – to change the political systems. A confrontation occurs between those resisting change and those fighting for change. The constitutional debacle becomes the frontier of either the perpetuation of violence, or creating spaces for the mitigation of violence. Past and contemporary approaches that have faced myriad difficulties include a series of peace agreements and the cessation of hostilities through politically oriented agendas. These agreements and policy development approaches are often not inclusive, lack local buy-in and are sometimes signed without looking at the local dynamics. Second another agreement that falls into the same category is the Arusha Peace and Reconciliation Agreement for Burundi of 28 August 2000, which was at the centre of the 2015 electoral crisis. The agreement did not prospect and put in place a mechanism to manage, amongst others, critical issues such as the eligibility of transitional presidents under a new constitution. And thus, a new inclusive constitution inspired by the ‘spirit’ of the Arusha agreement, gave birth to different interpretations on the term limit of the second transitional president. Arising from these interpretations, on his side, President Pierre Nkurunziza, contemplated that, under the constitution, he was entitled to two terms, while his opponents argued that such an interpretation transgressed the ‘spirit’ of the Arusha Agreement upon which the constitution was founded. It can be argued that such nuances of disagreement and confusion wouldn’t have arisen if the Arusha dialogue process and subsequent agreement were completely locally-driven and void of any foreign influence. The above agreements were – or are, in the case of South Sudan – supposed to provide mechanisms and policy guidelines towards sustainable peace in the relevant countries. However, their greatest dilemma, ostensibly, can be attributed to their failure (or potential failure) to lead to sustainable peace in the respective countries, arising from a lack of inclusive multi-stakeholder partnerships to sustain the dividends of stability and peace. 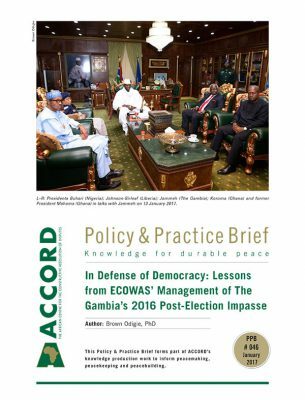 In looking at the current interventions – including the peace agreements mentioned – in terms of the desired results of peace, it can easily be noted that they performed dismally. There could be several factors behind this poor performance. One reason is that these interventions do not take the need to develop local capacities, networks and systems that are conflict-sensitive and peace-promoting seriously. They only serve the interests of political leaders and international communities. 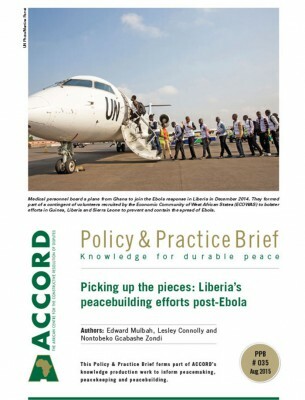 As a result of the above dilemmas, the GLP recognised the need for a paradigm shift that takes cognisance of the historical and contemporary dynamics of conflict, and which analyses the challenges of ongoing interventions before offering innovative approaches centred on enhancing community engagement. The GLP focused both on determining the levels of skills, capacities and experiences of conflict prevention actors; following which it reflected on how multi-stakeholders, mostly non-state actors could participate in state-driven stabilisation and peacebuilding engagements. The project also responded to the empirically identified capacity gaps while enhancing community and local ownership of conflict prevention strategies. The second principle is being context-sensitive in approaches to issues, and the identification and development of intervention strategies. This ensures that local and national CSOs and state actors are given the opportunity to direct and suggest issues at the local level and contribute to how they can be addressed. The third principle is based on the principle of free and uninhibited expression of ideas and issues, as well as independent operations of the involved organisations – in which decisions on issues and leadership are left to the members of the identified organisations. To sustain and enhance ownership, the fourth principle involves building structures, systems and norms. The GLP also ensures the development of an exit strategy, by facilitating and strengthening the relationship between the respective national civil society forums (NCSF) and national coordination mechanisms (NCMs), as well as the Regional Civil Society Forum (RCSF) and the ICGLR. It is important to note that the above principles should form the foundation, and need to be enhanced by actors working for and towards peace and stability in the region. If adopted, they are likely to contribute to sustainable peace and/or the peaceful resolution of conflicts in the ever-changing regional conflict dynamics. In the lifeline of the GLP, there are several lessons learnt or findings from which key policy recommendations can be made. Generally, the regional governments have embarked on the development and implementation of harsh laws and policies that impede the free operations of CSOs. Capacities among non-state actors in contributing to and interpreting the various conflict mitigation efforts, such as the agreements, must be enhanced to ensure local ownership of the process and the identification of potential fissures that could lead to future conflicts. That the Great Lakes region faces challenges and the possibility of a relapse into conflict is not debatable – especially given the trends, historical factors and emerging issues such as presidential “third termism” debates. Many countries in the region are shrouded in negative political contests and constitutional changes that favour the incumbents. From what has happened and continues to take place in Burundi and Uganda (arising from contested elections and electoral processes), scheduled elections in the DRC (later this year), Rwanda (2017) and South Sudan (not yet known) have the potential to plunge the entire region into another full cycle of violent conflicts. It is therefore imperative that the established forums broaden their collaboration with the existing state and non-state institutions to hedge the risks of relapse into conflict; and ensure that fault-lines are adequately identified and addressed to prevent their threat to stability and peace. Shyaka, A. 2008. 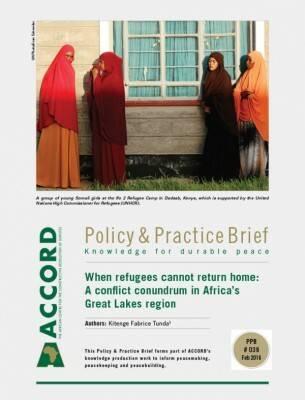 Understanding the Conflicts in the Great Lakes Region: An Overview. 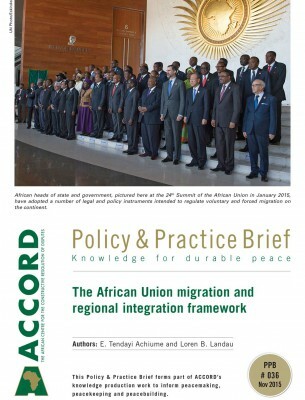 Journal of African Conflicts and Peace Studies, 1 (1), pp. 5–12. Okumu, W. 2011. Sudan Border Management and Security. Concordis Briefing 4, pp. 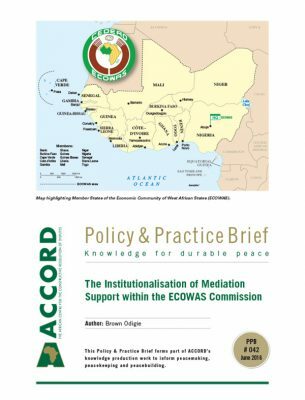 2–5, Available from: <http://concordis.international/wp-content/uploads/2012/11/2011_Sudan_Border_Regime_Briefing_4_BORDER-MANAGEMENT-SECURITY-II_LR.pdf> [Accessed 7 June 2016]. Carik, D.S. 2009. Porous Borders and the Insecurity of Civilians: Cross-border Violence in Darfur and Eastern Chad. 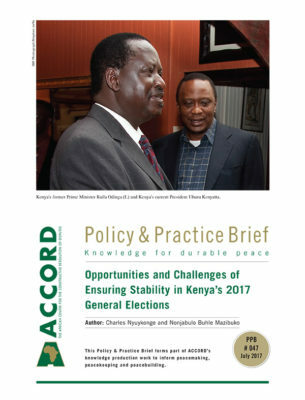 Policy Brief, Ford Institute for Human Security, GSPIA, University of Pittsburgh, cited in Okumu, W. 2011. op. cit. Ogenga, O. 1999. Rwanda Refugees and Immigrants in Uganda. In Adelman, H. and Suhrke, A. (eds) The Path of a Genocide: The Rwandan Crisis from Uganda to Zaire. New Brunswick, Transaction Publishers, p. 5. Gerad, P. 2009. Africa’s World War: Congo, the Rwandan Genocide, and the Making of a Continental Catastrophe. New York, Oxford University Press, p. xxxi. Barbara, F.W. 2011. Conflict Relapse and the Sustainability of Post-Conflict Peace. World Development Report 2011 Background Paper, 13 September 2010, p. 3, Available from: <http://web.worldbank.org/archive/website01306/web/pdf/wdr%20background%20paper_walter_0.pdf> [Accessed 21 April 2016]. 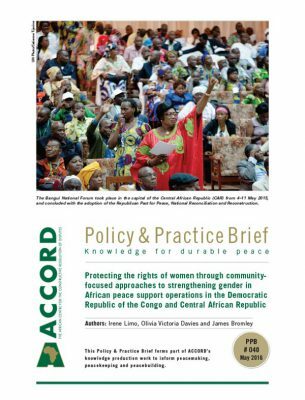 21 June, Available from: <http://www.issafrica.org> [Accessed 30 April 2016]. Seidel, M. (ed.) 2015. The Great Lakes Region in 2015. 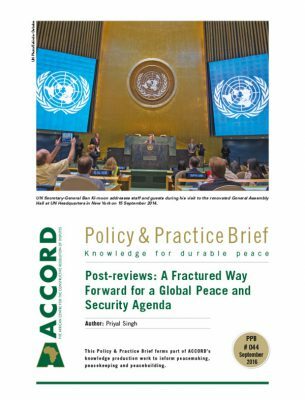 KOFF Newsletter, 137, Available from: <http://www.swisspeace.ch/fileadmin/user_upload/Media/Publications/Newsletter/2015/NL_137_en.pdf> [Accessed 27 April 2016]. <http://www.ucd.ie/ibis/filestore/Arusha%20%28Burundi%29%20.pdf> [Accessed 29 April 2016]. Lederach, J.P., Reuina, N. and Hal, C. 2007. 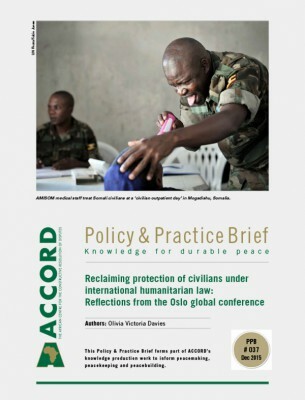 Reflective Peacebuilding: A Planning, Monitoring and Learning Toolkit. Mindanao, Philippines, The Joan B. Kroc Institute for International Peace Studies and Catholic Relief Services Southeast, East Asia Regional Office, pp. 3–5. Gurr, T.R. 2000. Peoples Versus States. Washington, DC, United States Institute of Peace Press, p. 66. Barbara, F.W. 2011. op. cit.